Pitch Perfect: Well, not exactly, however, the Boston Red Sox anticipated starting rotation of Jon Lester, Clay Buchholz, Ryan Dempster, Felix Doubront, and John Lackey have been all the buzz this Spring according to ESPNBoston.com. This year’s rotation has posted a combined 1.99 ERA in Spring Training action (including three shutout innings by Lackey in an exhibition matchup with World Baseball Classic team Puerto Rico). When you consider the combined rotation ERA was an appalling 5.19 a season ago, that’s a significant improvement thus far. Lester, Buchholz, and Doubront have all shown promise of good things to come in 2013, with solid starts in their recent outings. Lester has pitched 20 innings allowing only six hits and two earned runs with 16 strikeouts. Buchholz has went 13 and 1/3 innings allowing eight hits and one run. While Doubront has pitched 8 and 2/3 innings allowing seven hits and two earned runs with 11 strikeouts. Newcomer Ryan Dempster has posted solid numbers as well. Dempster has went 12 and 2/3 innings for Boston surrendering nine hits with three earned runs and nine strikeouts. As for Lackey, he is still a work in progress coming back from Tommy John surgery and has only worked 6 and 2/3 innings allowing six earned runs eight hits with only four strikeouts. However, Lackey has a 2.70 ERA in his last two outings for Boston, so there’s a silver lining for him. A Future at Fenway: Arguably one of Boston’s top player prospects Jackie Bradley Jr. has had a sensational Spring showing. Bradley Jr. has posted a eye popping .436 batting average in just 18 games this Spring with nine total runs, 17 hits, eight base on balls, four RBI and one HR. Should Jonny Gomes or Shane Victorino falter in the outfield, or if Jacoby Ellsbury is stricken with injury yet again, Bradley Jr. could receive a call up this season. Another top Sox prospect, whom we haven’t seen much of due to his participation in this year’s World Baseball Classic, Xander Bogaerts has been impressive with his glove work and faired well in the WBC for team Netherlands. Bogaerts played in 7 games posting a .263 average with five hits, one run, and one RBI. Bogaerts has went 1 for 2 with one RBI for a .500 average in one game with the Sox in Spring Training. Should he continue to have success in the minors, Bogaerts could be on a fast-track to Fenway by next season. Designated Dilemma: With the injury to David “Big Papi” Ortiz keeping Boston’s heavy hitter sidelined to start the regular season, the Sox need a solution at Designated Hitter. While it isn’t clear who the Red Sox will choose to fill Ortiz’ shoes until he returns, Mike Napoli would seem to be a logical solution until then. Napoli has hit well in Fenway Park posting seven HR’s, 17 RBI, and a .710 Slugging Percentage in 19 career games at Boston. Also, Napoli has posted a .348 average with seven RBI, two HR’s, and a .652 Slugging Percentage in nine games in Grapefruit League action this year. Granted, the Sox didn’t sign Nap to DH, they signed him to play first base and catch on nights when Jarrod Saltalamacchia needs a rest. However, with the Sox addition of Mike Carp from Seattle, Boston could slide a more than capable Carp over to first base and drop Napoli into the DH slot in the lineup, just as a temporary fix for Ortiz. Side Note: This is just a look at one internal option the Red Sox have to make up for the current loss of Ortiz. The Sox could also simply allow David Ross to catch and let Salty DH, which would keep Napoli at 1B and make for a better lineup. Napoli would stay as the number five hitter, Salty would move up to the number six spot with Gomes moving down to seventh, Ciriaco would move to eighth, and Ross would take Salty’s place batting ninth. Regardless of what the Sox choose to do, the DH position needs to be dealt with and soon. 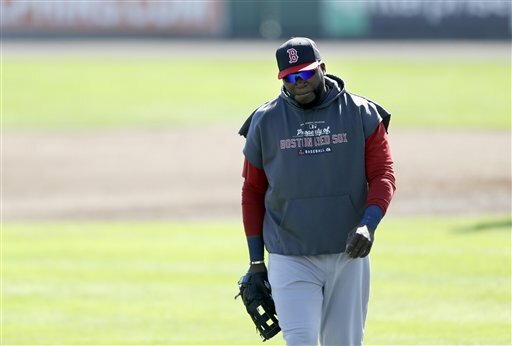 Final Thoughts: The Boston Red Sox are off to a solid start this Spring and look poised to turn things around in 2013. Of course, only time will tell what fate the baseball gods have in store for Beantown this year. 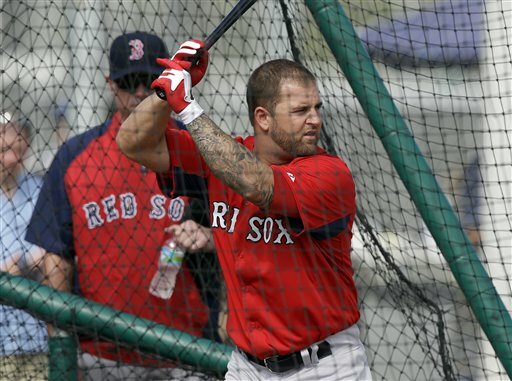 How do you think the Sox have looked in Spring Training? Who would you have DH for Boston? Leave a comment below. This entry was posted in Red Sox and tagged 2013 Spring Training, boston red sox, Fort Myers, Grapefruit League, mlb by tsmithbsb29. Bookmark the permalink. The website loading velocity is amazing. It sort of feels that you’re doing any unique trick. Moreover, The contents are masterpiece. you’ve performed a fantastic job in this matter!